It's upsetting to see your teen sad, especially when that sadness is the symptom of feeling disconnected, isolated and above all, lonely. 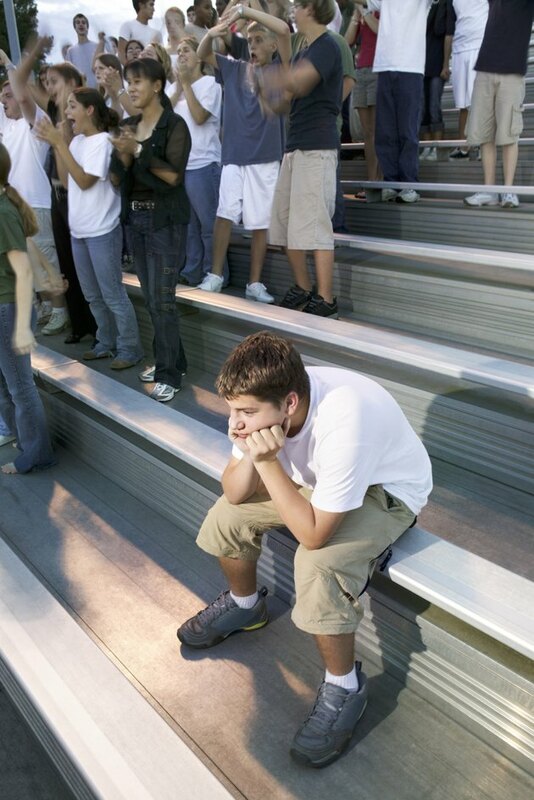 Loneliness in teens can cause a bevy of problems -- in a 2003 article for Psychology Today, Hara Estroff Marano even links a lack of connection to high school dropouts. Most of all, loneliness makes your teen feel upset and alone. As a parent, you need to walk the fine line between being supportive and smothering your teen when he's feeling less like a social butterfly and more like a social pariah. Loneliness in teens can stem from a number of reasons. Social awkwardness and bullying can often trigger isolation for your child. Changes, like moving to a new location, or family changes can also have an affect on your teen's ability to connect. Puberty is also a culprit, since it can wreak havoc on your teen's emotions, appearance and social comfort. Finally, teen depression can also have your teen hiding in her room on a Friday night, since social withdrawal is a common side effect of feeling depressed. If you notice that your teen seems lonely and has little connection with other teens, suggest activities outside of school. Sports, church groups and community groups are ideal for those who feel like they don't fit in with kids in a school setting. Lonely teens might also feel solace in the Internet: a 2010 study published in "Cyberpsychology, Behavior, and Social Networking" found that lonely teens were more likely to seek the comfort of online relationships, viewing them as more protective than face-to-face connections. That's fine for lonely teens, as long as they're being safe online -- a talk with your teen about sharing information and forming relationships is in order before using the computer as a coping mechanism. While you can't always prevent negative interaction between your teen and her peers, you can set a good example for making friends and meeting acquaintances. Smile at others and make solid friendships, reminding your teen that one good friend is as valuable as several casual buddies. You can also talk to your teen when she's feeling lonely -- knowing that she has someone to talk to can make her feel less isolated from the world, notes Josh McDowell in the Handbook on Counseling Youth. First, empathize with her feelings and then help her to see some of her positive qualities before directing her on how to be more social, make friends and connect with others. If your teen's loneliness is accompanied by symptoms like sadness, low self-esteem, sudden changes in appearance, talk or evidence of self-harm, a lack of enthusiasm or changes in eating or sleeping, contact your family doctor. These are common signs of teen depression and your family doctor can help you find a competent mental health professional ready to help your teen conquer his negative feelings and become more functional so he can begin to make friends and feel more a part of society.